Here is a quick note, something to take stock of. I invite readers to see what they can make of it. 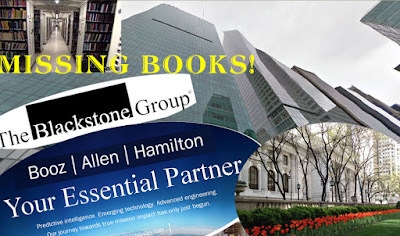 At the end of last month I posted an article about how the private spy company Booz Allen Hamilton, regarded by experts as an “arm of the [United States] intelligence community,” with the “federal government as practically its sole client” was hired by the NYPL to overhaul its most important libraries in a scheme that entailed the sale and destruction of the Donnell, Mid-Mahattan and SIBL libraries and the central research stacks of the 42nd Street Central Research Library. You should know, as background, that the U.S. contracts out the huge preponderance of its surveillance to private firms, and mainly to just a few firms with Booz Allen Hamilton regarded as the “colossus” of those few. In my article, (Snowden, Booz and the Dismantling of Libraries As We Know Them: Why Was A Private Government Spy Agency Hired to Take Apart New York's Most Important Libraries And Turn Them Into Something Else?- Sunday, October 30, 2016) I asked why a spy firm was hired in 2007 for a destructive reorganization of New York’s libraries when, only months before, in May of 2006, it was revealed that librarians had been fighting the federal government’s overreach of secretly taking PATRIOT Act surveillance into the libraries. Subject to a perpetual gag order, it took years before what was going on was finally revealed to the public, and it was revealed only because the Connecticut librarians involved had finally won their fight. In turning Noticing New York’s attention to the involvement of Booz and its motives in the dismantling of libraries I turned away, momentarily, away from Noticing New York’s previous major focus on the New York real estate industry’s push to plunder the libraries. Perhaps I needn’t have: Here is an interesting connection that has surfaced linking the two. A Noticing New York reader sent me information querying whether something the reader had found out wasn’t too close for comfort: That the spy firm Booz Allen Hamilton, like the NYPL’s prized 42nd Street Central Reference Library, is also located on Bryant Park. It’s just across from the library. As the park is not very big, that makes things very close. Actually, the library itself is technically in Bryant Park, actually on and still part of that city-owned park land. Something else many people don’t know: Most of the significantly diminished collection of books that are still at the 42nd Street Central Reference Library are actually under the park, in the park’s center connected by passageway underground. Receiving the information I was able to make still one more important observation. . .
For those who don’t know, Stephen Schwarzman’s name was put on the 42nd Street Central Reference Library (multiple times, five in all) in connection with the Central Library plan that removed its books and would have destroyed its research stacks. Frankly, once I understood the importance of Booz in connection with the library dismantling, I had already started researching for connections between Booz and other prime players in the library sell-offs, just as I had been looking out for connections between Blackstone and other principal players, like the connection between Blackstone and the NYC Comptroller’s office (we might hope that Scott Stringer has entirely terminated it) and Blackstone’s relationship with Senator Schumer, whose wife, Iris Weinshall, is now at the NYPL in charge of the NYPL’s continuing library real estate deals. The potential possible connections between Booz and Blackstone were myriad, but not necessarily easy to find out about or discern if they were there. Frankly, it hadn’t yet occurred to me that I should do some simple address checking. Now that the landlord/tenant real estate connection is identified, what does it mean? It could actually mean a lot of things. It could also, if you want to ascribe it simply to coincidence, mean nothing really. As it turns out the Bryant Park address, 1095 6th Ave #25B, New York, NY 10036, aka 3 Bryant Park, is being left behind by both Blackstone and Booz.. .
. . . Blackstone sold the building, inking its deal in November 2014 (the Central Library Plan got substantially disrupted May 2014, partly through lawsuits in which Citizens Defending Libraries, of which I am a co-founder, was a plaintiff). Booz is leaving the building (announced March 2016) to move across the street into 133 Avenue of the Americas (taking 23,000 square feet on the 28th floor, nearly doubling its presence), a Durst building, the Bank of America Tower, which is only a few feet shorter than the Empire State Building. Technically the 1,200 foot tower is the fourth tallest building in New York City. The building is another on the border of the park, looming over it. It would be the third tallest building in the city except that another building crept in ahead to rank between it and the World Trade Center Tower: We have now built an ultra-tall 1,398 ft residential tower, 432 Park Avenue, one of the new unprecedentedly tall buildings claiming the skyline to cast long shadows on Central Park. It is impossible to say exactly what these coincidences may mean. I present them here so that those who can do further research, or present information or insight they may already have, can do so. . . . Does it concern you that the country’s largest private intelligence firm involved with a dismantling overhaul of NYC libraries sits so cheek by jowl close to the preeminent research library thus subject to its dictates, and, similarly, so close to Mid-Manhattan, Manhattan’s largest circulating library? . . .
. . . If it does then you are also likely to be creeped out by the fact that millions of books shipped out of the 42nd Street library implementing the plan Booz was hired for went to a site in New Jersey immediately adjacent to the Forrestal Campus, a complex which has stringent federal security requirements as a laboratory devoted to nuclear fusion and plasma physics research.- Maybe the world of deep federal security has just become too omnipresent overall. . . . . Whether coincidence or not, does it creep you out that the nation’s largest private spy corporation hired by the NYPL for a dismantling overhaul of our city libraries was simultaneously the tenant of Blackstone, the world’s largest real estate investment corporation (plus many other things) the head of which, Stephen Schwarzman, was on the board of the NYPL pushing for that same dismantling overhaul?
. . . And then, as we become increasingly beleaguered by dominating big towers and their implications, there are those who will just be creeped out automatically to know that a corporation like Booz, the nation’s biggest private spy corporation, will be located in the third tallest office tower in the city.